Bill and Sue nearly fish food! After our hiking we decided we needed some R&R, for a change! 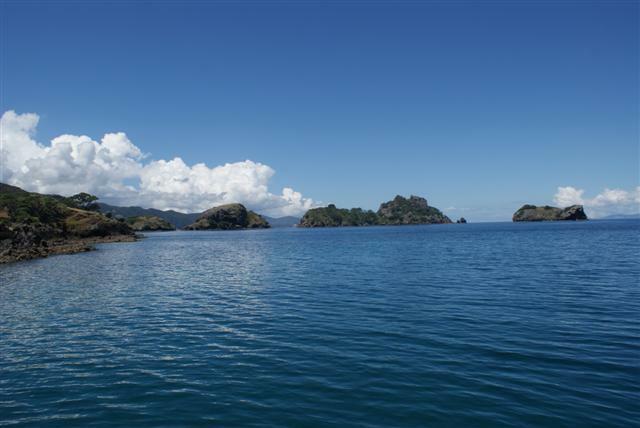 We left Kaiaraara bay and motored back towards the Broken Islands, a group of islands off the west coast of Barrier island. 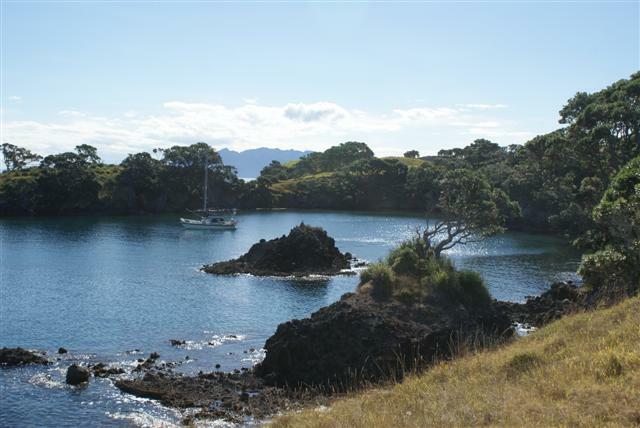 We had planned to visit them with Norsa but as it had been raining that day we had continued onto Smokehouse bay. 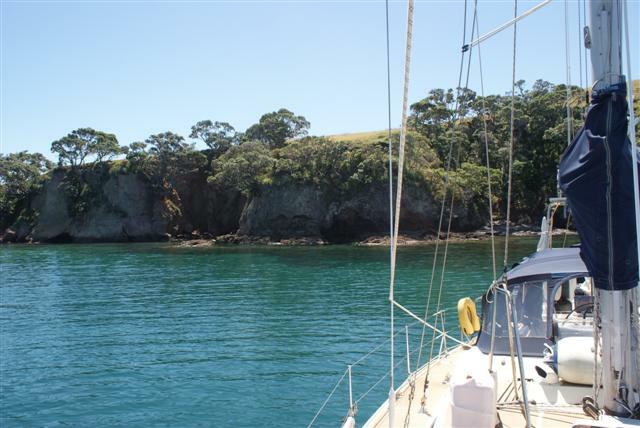 We tucked ourselves up inside an inlet off of Rangiahua island. We had the beautiful anchorage to ourselves. The water clarity was amazing and, for a change, warm. We could see fish swimming around under us so decided to have a snorkel. We didn’t stay in too long because we got cold quickly but in about 20 minutes we saw a small turtle, 7 stingrays and lots of edible fish. We went back to the boat and I got the fishing line out with the snapper rig to try and catch one. I carefully threaded a bit of squid bait on the hook and wrapped it round and round in bait elastic. I hate this because it goes all squiggy not to mention that it stinks. I took the dinghy in close and dropped my hook. The water was so clear I could see the snapper taking the bait but they were too small, they have to be 28cms long otherwise they have to go back. I kept pulling it away from the little ones but the big ones were nowhere to be seen. The greedy wotsits managed to eat my bait without taking the hook! I started again and tried 3 times but each time the little ones came and snaffled my bait so I gave up. I went back to the boat and Bill decided that he would bring his superior fishing skills to bear. (He added this bit!!!) A wait and a moderate amount of swearing resulted in not a single bite so I didn’t feel so bad. We’ve yet to catch one of these snappers, they are supposed to be delicious but I think the only way I’m going to find out is buy one from the supermarket! The next day was Sunday so we had a lazy day starting with a bacon and egg breakfast. As we don’t have a car for a Sunday drive we decided to go exploring the bays in the dinghy. The wildlife here is brilliant. 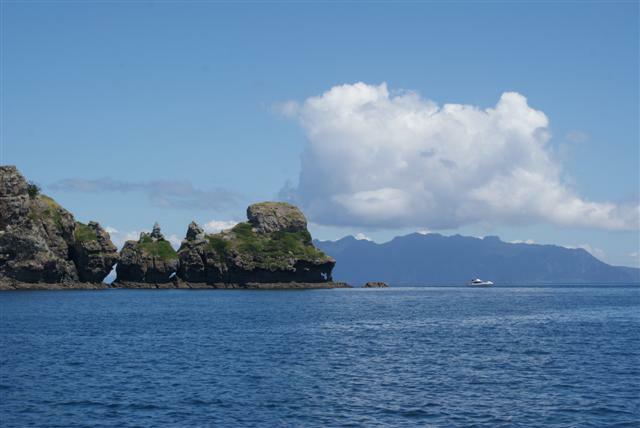 There was a Cormorant colony on the next island and they were making the most amazing noise. It sounded like a child screaming and we were relieved to find it was just the birds. On the other side of the island the water was quite deep and open to the ocean. What was lurking in the deep? On our way back to the anchorage we saw what we thought was a shoal of fish disturbing the surface and decided to go and investigate. We zoomed straight through it. As we turned back round we saw a huge fin surface and realised we were in the middle of a bubble net made by a pod of orcas fishing for their lunch. Orca, or killer whales as they are sometimes known are one of the oceans top predators and work together to hunt. Bill realised quickly that they would have no problem turning our dinghy over and might fancy us instead of the shoal of fish we had just scattered. Realising our vulnerability we headed straight back to the shallows. As I looked back there were 4 Orcas of varying sizes breaching right where we had been. Nearly fish food, too close for comfort!! 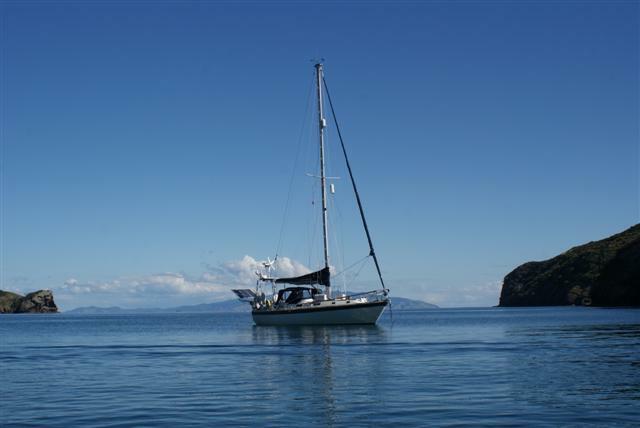 Posted on February 19, 2012, in Circumnavigation, Coastal cruising, Port posts, Redgrove, Sailing, sailing adventure, travel, Westerly, Westerly Sealord and tagged Great Barrier Island, Kaiarara Bay, orcas. Bookmark the permalink. Leave a comment.